The Beijing Olympic Flame continues its domestic journey. The relay in Nanning, capital of Guangxi Zhuang Autonomous Region, has just ended. It's the first time the Olympic flame travelled to an ethnic provincial region. Like previous legs, a minute of silence was held as a tribute to Sichuan earthquake victims. 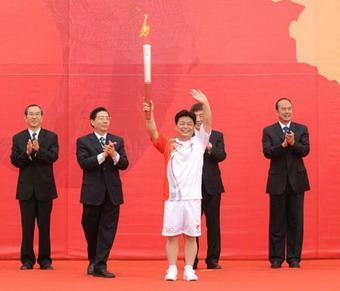 The first person to carry the torch was former Olympic weightlifting champion Wu Shude. The relay went along the main avenue of the city, past most of its notable architecture. The route was highlighted with Zhuang ethnic culture and China-ASEAN cooperation milestone structures. The relay included some handicapped and even blind participants. Some 208 torchbearers carried the flame along the 15 kilometer route, which ended at the China-ASEAN square. Nanning is the first stop in Guangxi Zhuang Autonomous Region.